Blizzard fans are a persistent sort, especially when we come across unsolved mysteries — for years in vanilla, people tried to unravel the mysteries of Ashbringer entirely of their own accord, simply due to a few hints placed in game. Players had a similar fascination with the crypts beneath Karazhan, trying to figure out their purpose, or when they would actually be implemented. WoW is full of all kinds of little mysteries, some solvable, some not, and players like to latch onto the hunt, regardless of whether or not they’ll ever find any kind of resolution. Now that Overwatch has been officially released, players are already clamoring for more — and just like WoW, Overwatch seems to be filled with tantalizing hints about upcoming content. But the one that’s currently on everyone’s minds — whether or not she ends up being the next hero released — is Sombra. Who is Sombra? Is she a new hero? Does she have connections to Overwatch… or is she working with more sinister intentions in mind? Update: With the possible leak of Sombra, we thought it was worth revisiting what we already knew about Sombra in this KYL from June. 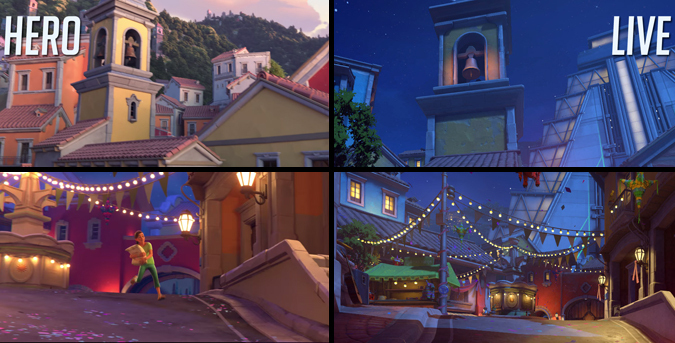 Sombra’s story begins with just a few small hints scattered around the Dorado map in Overwatch. A newspaper near the main square asks “¿Quién es ‘Sombra’?” — Who is Sombra? — with a photo of a mysterious shadowy figure. But more tantalizing clues are laid out in plain sight in the LumériCo facilities, where a set of files are laid out on a meeting table. 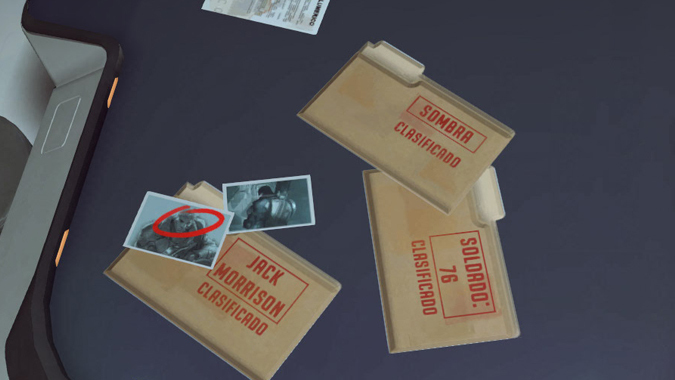 Two of these files are easily recognizable — one is Jack Morrison, former commander of Overwatch who is presumed dead. 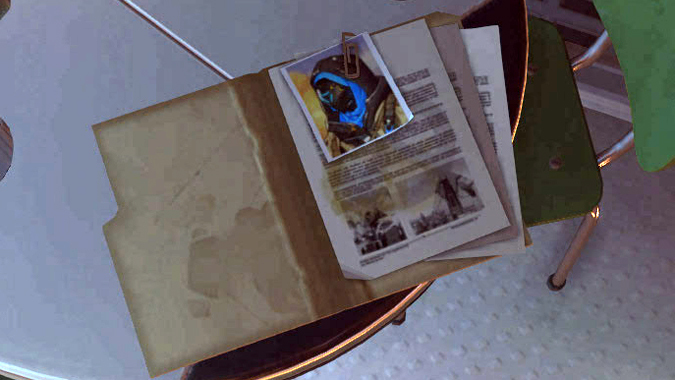 The second is a folder for Soldier: 76 — indicating that whoever was sitting at that table has solved the mystery of Soldier: 76’s identity. 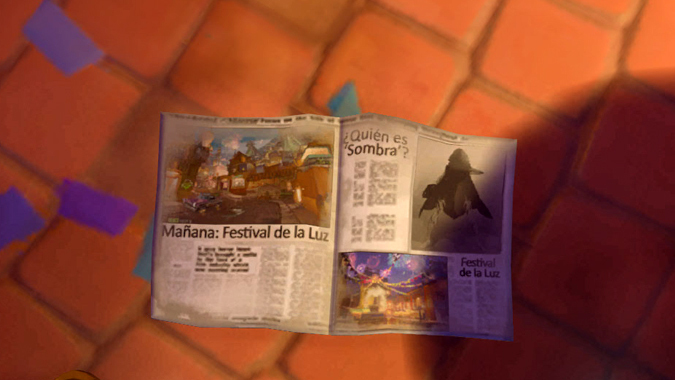 The third, however, has no visible photos or paperwork, but it’s clearly labeled “Sombra.” And if you take a glance around the map itself, you can see why LumériCo has a file — some screens have obviously been tampered with, and flash with a warning “Acceso No Autorizado, Protocolo Sombra” — Unauthorized Access, Protocol Sombra — indicating that either Sombra is involved with the protection of LumériCo, or Sombra was tampering with LumériCo’s facility. 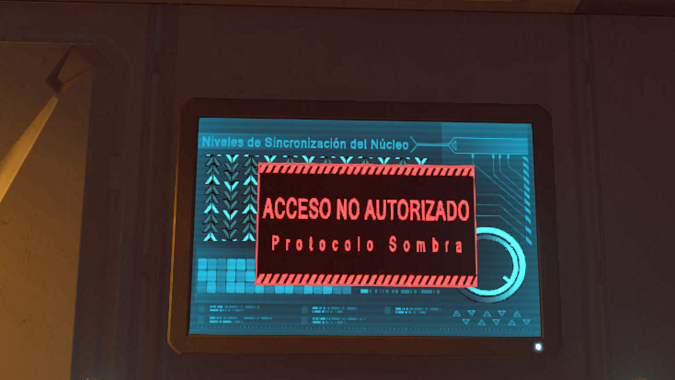 From both the file and the photo in the newspaper, it’s clear that Sombra is a person (or possibly an omnic), not just a watchdog program at the facility. But why the connection to Soldier: 76? Are they working for or against LumériCo? What’s their purpose in Dorado? For those answers, we need to dig a little deeper. Mexico was hit hard during the Omnic Crisis, a time commonly referred to as “La Medianoche” — The Midnight — by locals. In Dorado, an organization called Los Muertos roamed the streets. 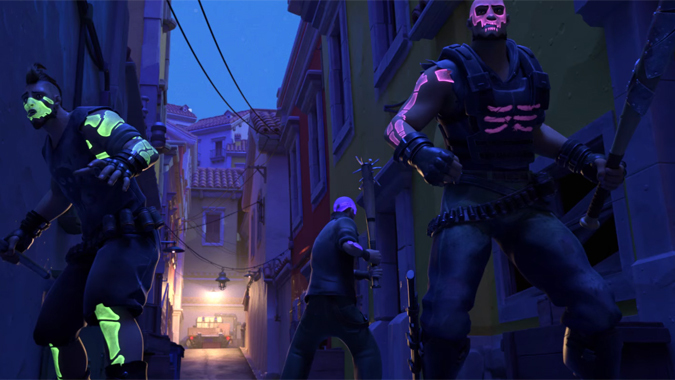 While commonly thought to be just an opportunistic gang, they viewed themselves as revolutionaries that represented those left behind by the government in the fallout of the Omnic Crisis — which sounds a little similar to what Lúcio was doing over in Brazil. But rather than trying to get the people to band together and rise up like Lúcio, Los Muertos seemed to be content to rule by fear, beating up omnics in the streets and possibly doing some kind of illegal weapons trading. In the animated short Hero, Soldier: 76 is in Dorado on some kind of personal mission to deal with Los Muertos and their illegal dealings. The short doesn’t really clear up what’s going on — nor does it clarify whether Soldier: 76 was ultimately successful in his mission. Los Muertos graffiti still exists in the streets of Dorado on current maps, so one can assume the gang is still around. But was 76 really in Dorado just to deal with a gang? We know he appears to be on a personal mission to expose the truth behind Overwatch’s collapse — did Los Muertos have something to do with it? Or was 76 in town for a different reason entirely? Corporations all over the world sought to rebuild after the Omnic Crisis — but they didn’t necessarily have the most altruistic reasons in mind. The Vishkar Corporation wanted to build self-sustaining cities, but in Rio de Janerio, it was clear that these cities were being built at the expense of the local populace. In Dorado, a different corporation has established themselves — LumériCo. That sounds pleasant enough, but there’s one other thing Soldier: 76 is out there to do. Five years after the end of Overwatch, Soldier: 76 began making a series of attacks on financial institutions, and “shadowy corporations.” Is it possible that Solder: 76 was in Dorado to investigate LumériCo’s plans? And what does this have to do with Sombra? Sombra translates to shadow — which all kind of ties in to Dorado’s history. Each year, Dorado holds the Festival de la Luz — Festival of Light — in celebration of the end of the Omnic Crisis and the darkness that engulfed the country when the omnics destroyed the country’s power grid. The thematic elements of light and shadow are heavily scattered throughout Dorado — from the soft light provided by LumériCo’s facility to the darkened, shadowy streets. Even Los Muertos plays into it — members use phosphorescent paint to paint their faces and bodies in skulls and bones that glow eerily in the dark. There are a lot of theories about Sombra. We know Sombra is a she, due to a Reaper voice file in which he states “Where’s Sombra when you need her?” — he’ll occasionally say it when both he and Soldier: 76 are on the same team. So Reaper — or Gabriel Reyes — knows about Sombra’s existence, and that Sombra is in fact a she. Some think she’s Pharah’s missing mother, due to a photo found on the Temple of Anubis map — a photo of a hooded figure that looks like it could be the same person in the blurry photo in Dorado’s newspaper. I don’t think she’s Pharah’s mother. I think the image in the Temple of Anubis is an entirely different hero — one that might be Pharah’s mother, or simply an undiscovered new hero. In the Pharah comic, Pharah doesn’t specifically say where her mother is, only that something happened, and the implication that whatever it was, it wasn’t good. I think that’s a separate mystery, still waiting to be solved. As for Sombra, I think the answer has been staring us in the face since the release of the Soldier: 76 short. I don’t think the Soldier: 76 short was a Soldier: 76 short, and I don’t think Soldier: 76 was the hero referred to in the title. At the end of the short, Alejandra asks him if he’s one of those heroes she’s seen in the posters around town, and all he says in reply is “Not anymore.” She goes on to say she thinks he is, but I think what we’re watching here isn’t a story about 76. It’s the origin story for Sombra. But wait, Alejandra’s a kid, right? …not so much. 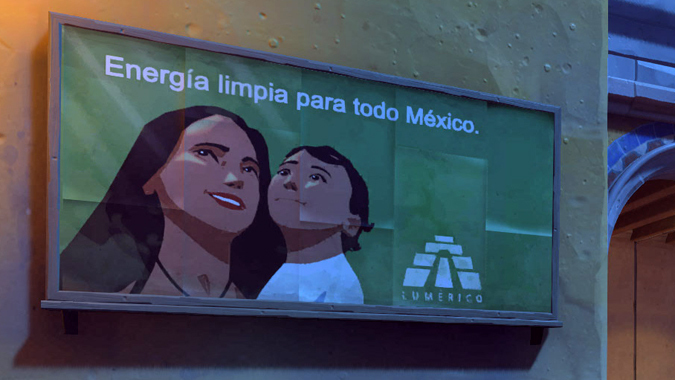 In the Recall animated short, the news ticker at the bottom of the screen notes that LumériCo has completed the first of its new power plants in Dorado. In game, there are several of those facilities scattered around the map, and in the LumériCo news article on Overwatch‘s website, CEO Portero announced the completion of the last link in the company’s network. It seems like time has passed between Recall and present-day Dorado. But even more time has passed between Hero and Recall — because if you watch the background in Dorado, there’s no sign of LumériCo’s plant at all. And if you hunt down the location of the little shop where Alejandra and her mother lived on the in-game map, that pyramid is astonishingly visible. You can see it from all over the map. You should be able to see it in the short, but it’s not there — meaning Hero took place before LumériCo rolled into town and started construction. I think in all likelihood, little Alejandra made the choice her mother worried about in Hero — the choice that would decide the direction of her life. She decided to be a hero after seeing Soldier: 76 in action. The photo of Sombra in the newspaper isn’t of an overgrown, super-muscled superhero, it’s slender legged and lean, like Alejandra was in the short. And if Alejandra is trying to protect her city, just like Soldier: 76 protected her, then maybe she’s uncovered something about LumériCo that indicates the company doesn’t exactly have the best interests of Dorado — or even Mexico — at heart. I don’t think Reaper really knows who Sombra is, and I don’t think he’s worked with her at all — I think the line was a sarcastic throwaway to 76, needling him about the young protégé he inadvertently inspired to follow in his footsteps. His shadow. Sombra. What’s Sombra’s future role in Overwatch? That’s another good question, because we have no clear indicator what her crime-fighting specialty happens to be at the moment. Maybe she’s future Overwatch material for Winston’s recruitment efforts, or maybe she’s just what her city needs — a protector, someone who is doing the best she can to help out, despite a lack of any obvious superpowers. Of course, this is all just speculation. That’s what makes little hints like these so fun to try and piece together — we don’t know what the real answers are. We don’t even know if there are answers, or if we’re reading into things way, way too deeply. But it doesn’t really matter, because the hunt itself is what’s so fun in this case. We never saw a resolution to the Ashbringer mystery in vanilla WoW, but we sure had plenty of fun trying to piece the mystery together. 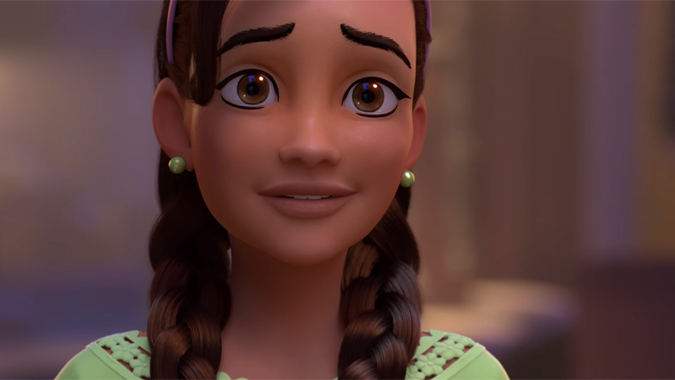 And even my theory isn’t necessarily correct in this instance — after all, Jeff Kaplan mentioned in an interview with Eurogamer that there are more hints out there, that we haven’t found everything, and that “it’s about time people are concerned with who Sombra is.” Of course, Kaplan could just be pulling our collective legs, too. Or he could be just as fascinated and delighted with our prodding around as we are with ferreting that information out. Either way, it seems that Overwatch has no end of mysteries waiting to be solved — we just have to keep our eyes peeled while we play.